While that is a lofty question, it is very understandable. Every golfer wants a quick fix to their game without practicing. But believe it or not, the golf ball you play can actually make a big difference in your game, even if you’re a casual golfer with a high handicap. However, this doesn’t mean you need to run to Titleist and buy the Pro-V1. Don’t assume that is the “quick fix” we’re talking about, and trust us, your wallet will thank you later. Just like clubs, clothes and even golf shoes, there is a golf ball specifically designed for your game, and a lot of the time that doesn’t mean purchasing the most popular or most expensive ball on the market. So if you’re unsure which ball to use, don’t fall into the hype and think about your game before making your first purchase. While we call this a “quick fix,” it may not actually be as quick or much of a miracle as you think. But, if you put in the research and enough thought into what is important to your game, the right ball will be immensely helpful and make the game more enjoyable. Pro Tip: Consider purchasing a sleeve at a time and test them out on the golf course so you can really see how the ball feels and how your game reacts before buying the first dozen. 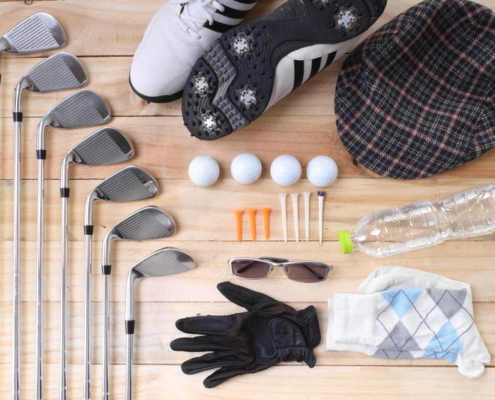 Components of the Golf Ball – What is the golf ball made out of? Developing a golf ball requires a lot of consideration and research in aerodynamics and learning what it takes to create spin, drag and distance from a golf ball when it is struck at various different speeds. Now, you will always see a synthetic cover made from various materials depending on the type of results manufacturers are looking for in a ball, filled with several layers of composite synthetic material. Each variation of the golf ball is designed specifically for particular swing angles and speeds, or in other words, different skill levels. 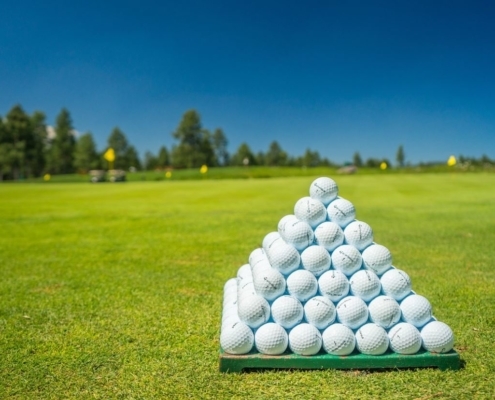 Golf balls you hit on a driving range are normally one-layer golf balls, because they are cheap and unless you’re a member of an exclusive country club, performance and quality is not expected from a driving range ball. However, it’s when you get to the three and four layer golf ball where quality can be felt, especially from a more experienced player. When you have more layers, you’re able to have the best of both worlds, a soft and forgiving casing, but a complex center to achieve a high performing shot. As you look through different golf ball designs, each of them will exhibit different levels of spin. Typically, the more experienced the player is, the more spin you could potentially integrate into your game and take advantage of high spin golf balls. Spin is created by the face of the golf ball — the material it’s made of, how many dimples, etc. Low spin allows for more roll and less variance in direction while the ball is in flight. High spin creates the opposite, more carry, but more chance to curve the ball — wether its intentional or not! When looking for a golf ball that fits your skill level, a big determining factor is looking at the compression-level. This website here created by the Golf Info Guide offers great detail on the compression-level of every golf ball on the market, and it will tell you how fast your swing speed needs to be in order to be compatible with that particular compression-level. For example, the ball mentioned above, the Pro-V1, has a compression in the high 80’s, which means you need a swing speed of over 100 mph to reach the ball’s full potential. This means that for you to actually compress the ball and notice any sort of improvement in distance or control, you would have to hit the ball consistently at 100 mph. In other words, you may as well hit a single layer golf ball you would find on a driving range. So, in order to find the golf ball that will truly improve your game where you can see a difference, we recommend you match the compression-level and cover softness to your swing speed. It’s when we get into the more skilled player when we can start discussing spin, layers, and level of control. But with all this information said, let’s dive in and decipher what all this means for your game, and which ball is right for you. Picking Ball Based On Skill Level – Bogey-Golfer or Birdie-Machine? For players who are just getting into the game and need a little more forgiveness and accuracy, playing a softer golf ball, with a less complex core — meaning less layers — is a good place to start. Worrying about spinning the ball around the green is not necessary at this level, and it would be important to look into which ball feels the best. At a beginning level, the ideal golf ball should offer: straight ball flight, extra distance, and less spin to avoid aggravating your occasional (or maybe more often than you’d like) draw or fade. As much as we watch the pros hook it 20 yards around a tree onto the green — on purpose — accomplishing that may not be in your future yet, so why buy the ball that works for that specific, technical, more difficult shot? Callaway Supersoft: This ball has a “supersoft” cover for the best possible feel, but it also has a two-layer core, allowing for a straighter, more consistent ball flight. Most importantly, the compression-level is low, allowing for that lower swing speed to hit the ball and enjoy that extra length off the tee. Not to mention, a dozen golf balls (with the yellow option as well — very helpful for the issue of lost balls) are only around $20. When you’re a competitive golfer with a lower handicap, it is more common to have the ability to control the ball on your own and get creative. So, this situation would be a good opportunity to experiment with more layers in your golf ball. When you start introducing more layers into the ball you play, your accuracy may go down, but you may notice that playing with bending the ball will feel that much easier. You will also notice an increase in spin, which could benefit you around the greens and getting that satisfying halt when the ball lands on the green. But, be sure to continue to pay attention to your swing speed and what level of compression you require. TaylorMade TP5: More and more professional golfers are switching to the TP5 (Rickie Fowler most recently switched to the TP5 and just won the 2019 Waste Management Open) so we would recommend the more experienced player with a high swing speed to try this one out. It’s extremely responsive around the greens to spin and stop on a dime, and more notably, its length off the tee (if you’re swinging over 100 mph,) has been very favorable. In addition, you aren’t sacrificing feel because it still has a soft cover! However, just because you are a lower handicap player, that doesn’t mean the only ball for your game is a hard cover with more than two or three layers. At the end of the day, it’s all preference. So, if you prefer accuracy with the straightest possible ball flight, and you aren’t too concerned about a little more roll around the greens, sticking with a two-layer ball or maybe a lower compression-level ball is NOT a bad thing. Titleist NXT Tour: This is perhaps one of the more underrated golfballs, being that its older brother is the “#1 ball on worldwide tours.” It requires a higher swing speed, but it still has that satisfying softer feel you find in a more forgiving golf ball. You can manipulate the ball to spin a little bit, but not as much a a premium “pro-level” golf ball. It cooperates with the straighter shot more than anything else. At the end of the day, we recommend that expensive is not the answer. You may find that a bargain ball, like the Callaway Supersoft or the Titleist NXT Tour, it may be the most productive ball that matches best with your game — and that’s the goal! Finding your match, regardless of brand and price tag is all that matters. So, best of luck, try everything out, and may your ball be far, straight and always closest to the pin. Picking A Ball For Your Style of Play – What’s Your “Flavor”? Another way to decide what type of golf ball you should be looking for, is what you are looking to achieve on the golf course. While we all would love to have a perfect all-around game, we have to pick and choose our battles. So, depending on what part of your game you feel confident with — or where you want to feel more confident — choosing your ball accordingly would be very beneficial. This way, you may be more likely to see results if you cater to a specific aspect of your game. If you want the maximum distance with your driver, pay close attention to the compression-level and your swing speed. You’ll want to take advantage of that compression and make sure you can reach the ball’s full potential. In 2019, this could be considered a traditional way of playing golf. With pros like Dustin Johnson blasting it over 300 yards, (he plays the TaylorMade TP5x,) there isn’t much need for shaping around the trees, or worrying about bunkers. Why worry when you can just hit it over everything? But, if being creative is what catches your fancy, or you just naturally are not that long off the tee, finding a ball that allows for shaping shots would be highly beneficial. We recommend searching for a ball with more layers, and maybe a little more spin factor, which allows for such complex shot-making. This is very similar to the previous style of play, but if you’re interested in spinning the ball within your short game and having the ultimate control, finding a ball that allows for a lot of spin will be best suited for your game. Keep in mind, this isn’t for the beginning player or someone who does not have as much experience with spinning the ball (on purpose.) With a lot of spin, also comes less accuracy, meaning a less forgiving ball. So proceed with caution, but enjoy the benefits if you’ve got the skills! There are A LOT of golf balls on the market in 2019, and it’s not getting any easier to navigate. But, once you dissect your game, and what goes into the components of a golf ball and what they all mean, it gets easier. Even for a professional athlete, they are constantly testing golf balls trying out several different brands and models before a decision is even made. Because it is so complex, it takes even the most skilled golfer a long time to choose a ball. Not every aspect of the golf ball equals a definitive answer of who it’s made for. For example, the soft cover, we’ve mentioned that several times here, and this preference could apply to almost every kind of golfer. So, take a good look at your game and identify what you’d like to improve or enhance. Most likely the perfect ball is out there waiting for you.